Alarm at 6:00 am, but I have trouble making a speedy exit. I've run out of small bills, to pay the hotel bill, and the clerk at the front desk can't help. I bike down the street to revisit an ATM, to get a smaller value, but I'm forced to take another 50 TL note. Although the exact-change problem hasn't been solved, I must admit that, with Syria still a few hundred miles away, this extra Turkish currency feels good. I cross the parking lot to one of the bus kiosks, where change is made for me. 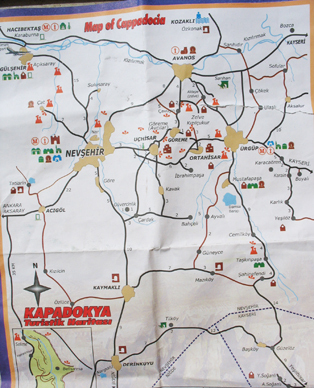 I plan to take scenic route out of Göreme, and use this opportunity to confirm my route. The guy behind the counter discourages me. "Much further," he indicates, which my map doesn't support, and "Poorly marked," which may be the case. What the hell-I justify taking the same route out as I took in since at least it will get the ugly climb out of the way early. I got back to the hotel , pay the bill, and take the same route out that I took in. I'm triggering lots of dog-barking, but all the dogs are chained. But soon enough, three that are not chained bound after me. On this steep climb I would have trouble outrunning a turtle, so I get off the bike and walk it, testing the advice I got the other day. It works. Just outside of Nevsehir I spot a bicycle/motorcycle shop that's open. I decide to be proactive about my rear rack which has cracked at one of the welds. The proprietor speaks German, but quickly understands that I want the rear weld repaired. A policeman comes over and in excellent English asks if he can help. I repeat my desire and, per what I've read on the internet in another bicycle journal, emphasize that the rack is aluminum and not steel. "No problem", I am told. I strip off my rear panniers, and hold the bike as he attaches grounds. He signals for me to look away, and a bright series of flashes lighten-up toe room. I point the camera behind me, taking a picture, to document this smart, preemptive bicycle-repair. The man's now filing away at the aluminum, trying to get a better ground or something, and I'm getting slightly worried. A few moments later: "Problem," he says, "No good." I look back. Jeez, this guy has dissolved the aluminum that up until moments ago was reparable with a piece of my strapping tape! 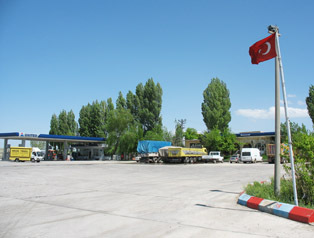 Just outside of Nevsehir, I take a turn, and begin heading south. Soon I spot a large, mostly abandoned town on the hillside to the east. Highway markers indicate that it's Göre, and it does look spooky. I wonder how old it is. 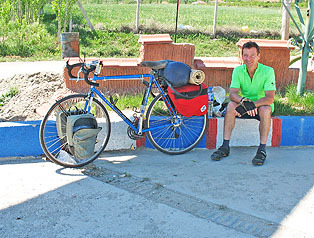 I continue bicycling, eventually through the "underground cities" of Kaymakli and Derinkuyu. I'm dealing with some headwinds now, and I don't even think of stopping. Life's OK, though-my bus is at 4:30 in the morning, and I can make it to the bus stop at Nigde in time, even if I have to walk! I find the Nigde bus terminal ("otogar") with little difficulty. It's 3 pm and the ride-part of my day is over. The inside of the bus terminal feels like an airport's car rental area - little counters all scrambling for business. At the Kent counter I learn that the bus to Antakya is not at 4:30 am, but rather at noon, 8 pm, and 1:30 am. Good news, but I'm curious why the Kent kiosk in Göreme didn't have the same information. As I'm struggling to communicate at the Kent counter, a man gets involved, translating, and, frankly, really making life easy for me. With his help I buy the ticket, confirm that getting the bike on the bus will not be any problem at all, and pay 25 TL (not the 35 TL + 10 TL for the bike rate that I've been quoted in Göreme). He gets me a soda, has my bike taken over to the luggage check, and points-out the terminal's internet café. I spot a "toilets" sign that includes a shower-head logo, but learn from him that the shower facility no longer exists. I rinse-up as much as I can in the somewhat squalid bathroom, then go back to the luggage check, where I get the OK from the attendant to do a clothing change. A little funky for me (and perhaps for the attendant, who may not have expected the full monty!) but better than trying to keep everything off the floor in the squat toilet cubicles in the bathroom. Refreshed and clean (somewhat) I join Muharrem back behind his bus company's counter, where he begins the conversation with, "I really enjoy the television show Frasier." That sets the tone - we have a great conversation bouncing from TV programs to movies to actors and actresses. Nothing important. After an hour or so of distracting my friend, I feel guilty that he is not getting any work done, so I break-away to use the internet café. Afterwards I wander around the downtown, get a bite to eat, and work my way back to the bus stop. The bus arrives. There is no problem getting the bicycle underneath, and I learn the hard way that seats are assigned. When I'm finally in my correct seat, I find myself two rows away from a colicky baby. I'm tired and trying to use the MP3 player to drown-out the child, but the situation stinks. One nice touch: during the ride the bus attendants provides everyone with little single-serving cups of water, and later, towelettes. The baby gets off somewhere in the journey and at 2:00 am I'm awake as we approach the last stop - Antakya. I ask the attendant if there is a hotel near the terminal. "Yes," he replies. We arrive at the terminal, and it's in the middle of no where. I can't see a light for miles. A cab driver spots the non-Turk and approaches me. "Otel?" I ask. 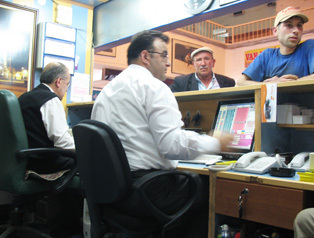 "Antakya," he replies and indicates with his fingers 15 Turkish Lira. I resist, politely saying, "One moment," and walking inside the terminal building to check out the situation. The building's empty, with one guy sleeping in the chair. Hmmm. I can pull this off-I've got a sleeping bag and pad-but what am I trying to prove? I go back to the cab. I take the baggage off, and the driver squeezes my bicycle through the back hatch of his small wagon, filling up much of the trunk and back seat. We add the baggage, and then as I prepare to get in the front passenger seat, he adds two more passengers, in the back seat no less, where the bike is pressed against their heads. I offer to go on the back seat, but "No problem," he replies. The four of us take off, and after a series of twists and turns he drops the other passengers off. He speaks no English, but indicates "Family". More driving… Boy, I'm glad I didn't try to bike this - it's jet black and feels far. He signals that we're now in the downtown. He points out a big hotel, indicates "too expensive," by rubbing his fingers, then points out another, then another. We go about two blocks from must have been the main plaza, and he points out a few more hotels. He parks, and leads me up a flight of stairs. It seems that there's is no room in this 20 TL hotel. He scribbles on a scrap of paper three numbers: 10 TL, 30 TL and 35 TL. He seems to want me to select a price point for the next hotel. It's about 3 in the morning, and I've ridden a full day, plus sat on a bus for hours, so I'm willing to treat myself, but then I realize that I've had OK rooms for 15 TL, so I point to 10 TL. He nods, and leads me around the corner, and up another flight of stairs. The room's basic, and I'm signaled "No shower until the morning", but I take it. The rate turns out to be 15 TL and it is the worst deal I've had so far-I use my sleep-sack to stay off the suspect mattress and I fall asleep. 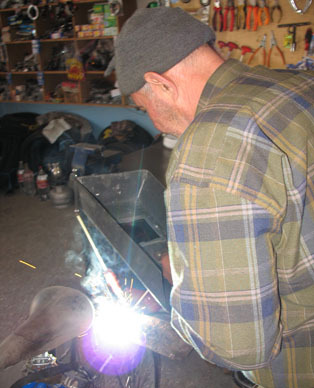 Welder melting my Blackburn rear rack. 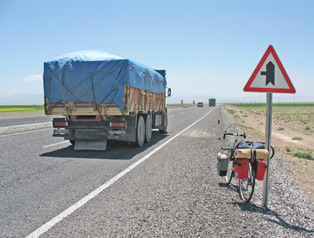 The highway south of Derinkuyu. Finding shade was increasingly important. The key to good food was gas station reststops - look for the trucks. The view from behind the bus counter.